Nursing Moms, Beware Of What You Eat! 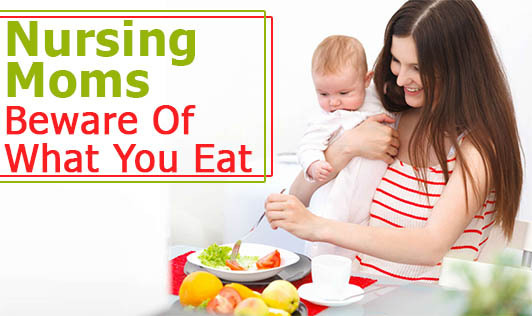 Nursing mothers should eat a balanced diet and the foods they love the most. But, certain foods no matter how much you love them, your baby may not agree to it. If your baby gets fussy, has colic, diarrhoea, constipation, spits up often, has congestion or gets skin rashes, then check your food for the culprit. If you are sure that your food is causing discomfort to your baby, then eliminate one culprit food at a time. Check for the symptoms in your baby, before you eliminate the next food. The food you quit may take more than a week to be out of your system completely. If the discomfort is caused through your breast milk, it could be due to the food eaten three to six hours ago. This would give you an idea as to what food is causing the problem. • Fish like swordfish, King mackerel and Shark should be avoided as they may contain high levels of mercury. Also, fish from contaminated water sources should be avoided. • Processed foods as they contain too many additives. • Foods containing artificial sweeteners and artificial colors. • If the mother and father of the baby are allergic to any foods, it is best to be avoided while breastfeeding. Be aware of these signs that indicate that your baby is allergic to some food in your diet. Most babies stop having these problems after about three months, when their digestive systems start maturing. Your baby's tolerance level to different foods increases as he gets older. It is also important to note that all foods do not affect all babies. Every mother and baby is different. Keep a close watch on what you eat and how your baby responds. If you have to eliminate major foods like dairy products, then consult with your dietitian about how to balance your diet with the right alternatives. Remember that any deficiency in your diet can make your baby malnourished too.